Fighting families are a familiar story line in combat sports. Boxing fans can trace the lineage of names such as Frazier, Patterson, Mayweather, Camacho and Chavez. Mixed martial arts enthusiasts have long cheered for the brothers Diaz, Nogueira and Shamrock. Even in the smaller circle of New England Fights, regular followers know the father-and-sons angle of the Bang family, as well as some notable domestic partnerships that have stepped into the cage separately on the same night. “NEF 38: Stormborn” will serve up a unique variation on that theme Saturday, April 27 at Aura in Portland. That’s where two parents, both of whom took a two-year hiatus to bring a son into the world, will take that renewed purpose of their lives into the cage for the first time. With their 15-month-old son almost certainly somewhere in the building, the Dover, New Hampshire-based couple of Keegan Hornstra and Adina Beaudry will be at center stage. 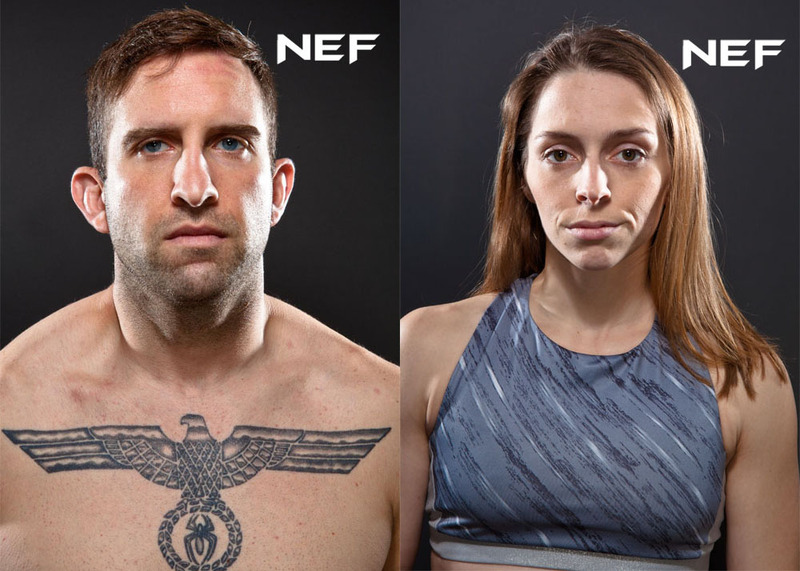 Hornstra (3-10) takes on Zenon Herrera (1-7) in a battle of professional welterweights, while Beaudry (2-0) tackles an amateur strawweight scrap with Traci Baldwin (1-0). Young master Niklaus is never far from mom and dad when they’re hard at work training, either in nearby Somersworth at Nostos MMA or in Saco, Maine, at Evolution Athletix. Beaudry said that when Niklaus sees one of his parents lifting weights, it’s standard procedure for him to pick up one of the lighter kettle bells, himself. Then again, sweating it out and daydreaming about combative challenges are strong family traditions. Hornstra started karate so young that he also can’t remember exactly what age it was, although he said there is photographic evidence of him in uniform at 7 or 8. Martial arts instilled him with confidence, but perhaps also set him up for a dose of humility, as he moved into middle school. That experience encouraged Hornstra to broaden his stand-up routine, including Muay Thai study. After joining the United States Army, he gravitated to grappling, then Brazilian Jiu-Jitsu. Once his enlistment was over, Hornstra pursued MMA as a natural outlet for putting together all those disciplines. Including amateurs, he’s a veteran of 21 cage fights. In addition to his break for the transition to fatherhood, Hornstra has devoted much of the past two years to training other MMA fighters on the boxing side of the ledger. One notable pupil is Zac “Rocky” Richard, who will battle Tom Pagliarulo for the vacant NEF amateur featherweight championship at Stormborn. Hornstra also enjoys helping train his child’s mother and sees her as a major player in New England’s still-developing roster of female fighters. Beaudry also started out in karate as a teenager. “I’ve done grappling, catch wrestling, Muay Thai, all the different martial arts disciplines,” she said. Even after motherhood, Beaudry said it will be a challenge for her to bulk up to 115 pounds for the bout with Baldwin. She would like to see the dawn of a true atomweight (105) division in the area but doesn’t envision enough fighters on the horizon at present. Beaudry and Hornstra train under the talented duo of Nate Libby and Taylor Costantino at Evolution. All the while, the thought of two much less experienced eyes watching them serves as a driving force. Do they worry about Niklaus turning 18 someday and tackling the inherent risks of the cage? The eye roll and shrug were audible in Beaudry’s voice. “There are a lot of things in the world that worry me a whole lot more than the idea of him fighting,” she said.